Enticed by the promise of greater availability and flexibility at a reduced cost, enterprises are virtualizing tier-one, mission-critical applications now more than ever. Those applications are typically comprised of several virtual machines, span servers and storage arrays, have aggressive service-level agreements (SLAs), and require robust, effective and automated failover and failback. Unfortunately, traditional business continuity/disaster recovery (BC/DR) approaches are complex, rigid and inflexible, and IT departments have struggled to protect these applications in a virtual environment. Want to learn how to mitigate data loss, minimize RPOs and RTOs, and ensure a high degree of service continuity? Join this interactive webinar and discover how to protect your applications, not just your data. •Leading 451 Group Analyst Dave Simpson will discuss the industry drivers for virtualized mission-critical applications, core challenges of traditional BC/DR approaches, and the key features needed to ensure a robust, yet flexible, BC/DR solution for a virtual environment. 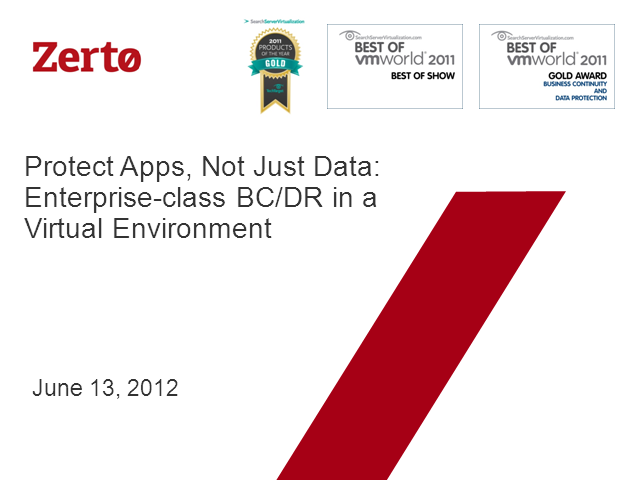 •Gil Levonai, VP of products for Zerto, will quickly highlight a revolutionary technology, hypervisor-based replication, which simplifies enterprise-class BC/DR in a virtual environment. •Your peer, Mark Montagna, IT Infrastructure Manager for The Philadelphia Contributionship, will share his experience including: previous BC/DR challenges, selection process, the Zerto implementation and resulting benefits.